I’ve been living in Manila for almost 27 years, and believe it or not, last Sunday was my first time to witness the parade of lechon (roasted pig) at La Loma, Quezon City. La Loma celebrates their town feast every third Sunday of May, and part of their tradition is to parade lechons all over town to thank the creator for a wonderful business opportunity that he has given to them. La Loma in Quezon City nests about a hundred of lechon-based restaurants. Some of them are very popular now not just in our country but in the whole world like Mila’s Lechon, Ping-Ping’s Lechon and many more. I was very excited upon learning last Sunday that the parade will start at 2 p.m. With just a tricycle ride from our home, I didn’t hesitate to go there and geared up for this gastronomic adventure! I arrived in La Loma just in time for the parade. People were lined up on the sidewalks as they are enjoying the wonderful dance performance of the bands. Then, after some few minutes, the floats from different restaurants of lechon showcased their very unique presentation of lechon to the public. From politics, television, movies and even histories, these lechons were all gathered to promote the growing lechon industry in La Loma, Quezon City, to entertain people and to thank God for the overflowing blessings for the entire year. There was also some came bare-naked. Unfortunately, this lechon wasn’t able to reach the finish line of the parade. Hahaha! And there were also some volunteer lechons. I also saw Nadine Samonte, who is a resident of the said town. 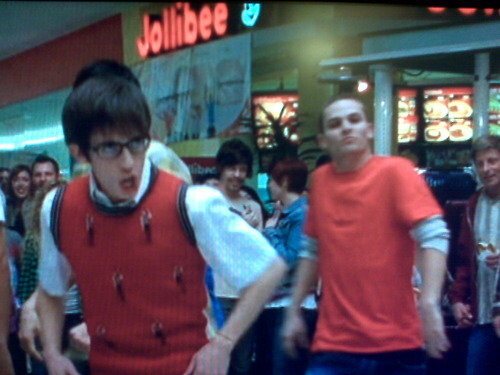 And also Jolibee, who I heard is now on Glee! Wee! After the parade, Ence took me to her grandma’s place in La Loma where we had one uber delicious post-lunch. Thanks, Ence! All in all, the parade was really fun. Despite of the burning heat of the sun, people were very supportive in lining up on the sidewalks to watch this annual celebration of this drooling festival. I just wish that next year there’ll be more lechons on the parade and may the local government keeps on supporting this mouth-watering event. And happy eating to all!